If you’re not blessed with a large kitchen, it can be a challenge to make the most of what you’ve got, find a place for everything as well as trying to give the illusion of more space. 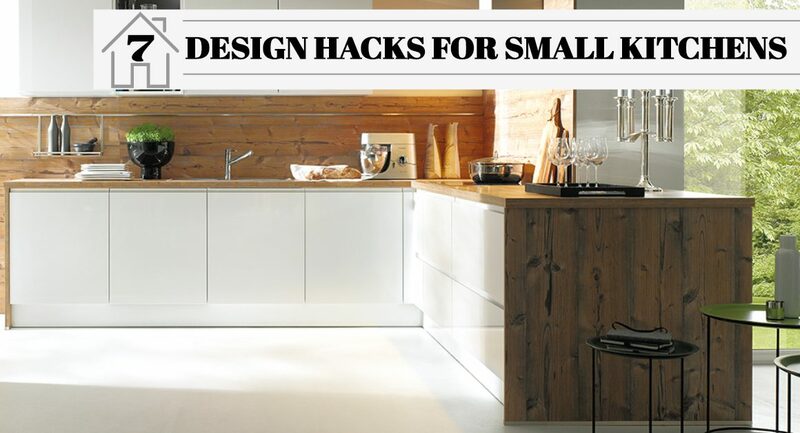 No matter how ‘compact and bijou’ your kitchen is, there are a number of ways to maximise the available space, utilise every cupboard and design hacks to give the appearance of a more generous room. If your worktops are clutter free it will have a big impact on the appearance of the rest of the room. 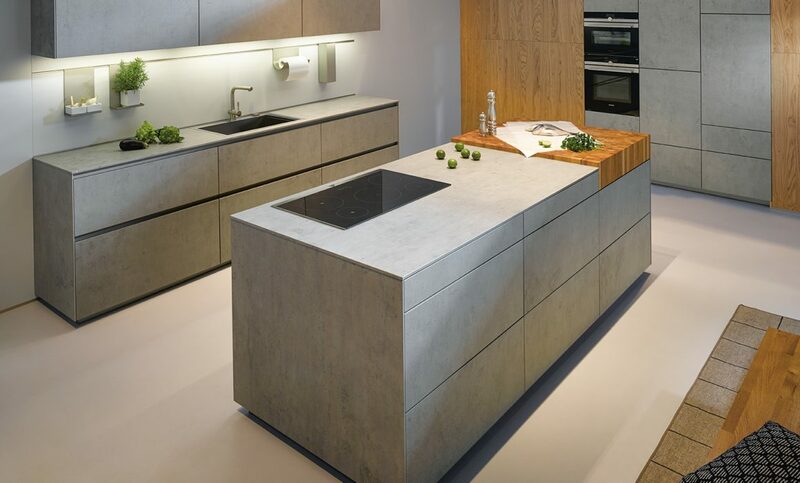 Take a look around and ask yourself if everything on the worktops needs to be there. Could it be stored in drawers or cupboards instead? Wall panelling is a feature that can work well in a small kitchen. It houses items that usually sit on the worktop such as kitchen rolls, utensil pots and knife blocks. It’s not only a practical solution, it also becomes a design feature and is available in a plethora of colours. In small kitchens multi-tasking appliances such as washer-dryers and hobs with built-in extraction are perfect, as they do the job of two appliances but only take up the space of one. 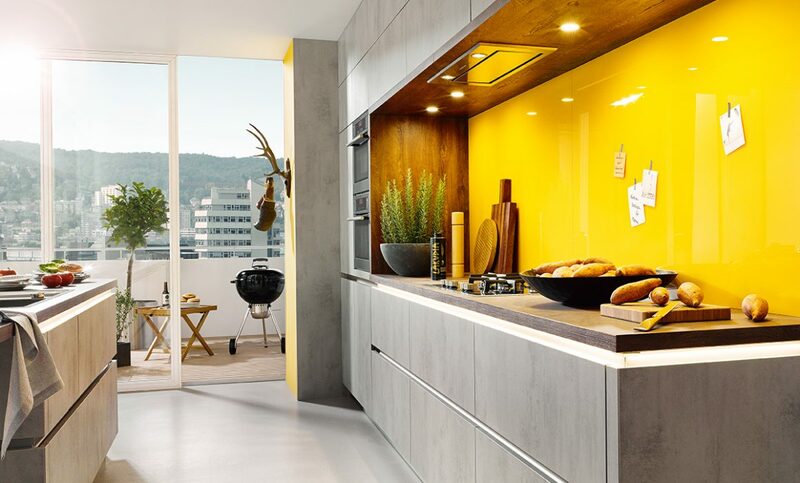 Integrated appliances will also help to give the illusion of space as they’re hidden away so give an uninterrupted run of your chosen unit doors. Another gadget to consider is a boiling hot water tap. It functions as a regular tap with the added benefit of instant boiling water, meaning you can save even more space on your worktop by getting rid of the kettle. In a small kitchen it’s essential to maximise every available inch in cupboards and drawers. 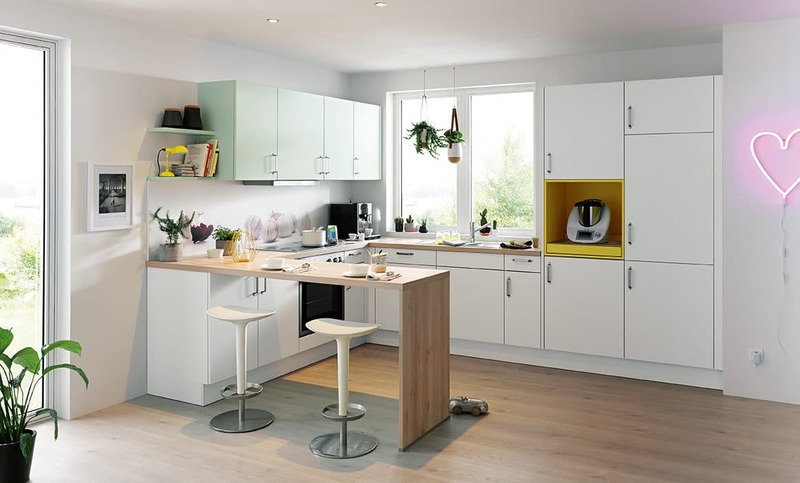 There are plenty of storage solutions to choose from when planning your new kitchen and, using specific kitchen storage is the best way to make the most of your space. Cupboard storage options include tall pull-outs fitted with deep drawers, swivel units for corner base units and pull down storage shelves for wall units. 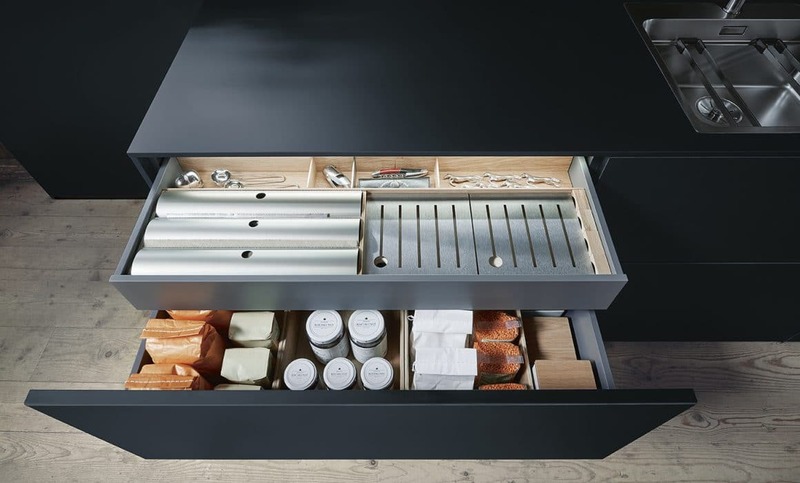 Drawer storage can include plate pegs, pan lid holders and drawer organisers for your cutlery and utensils. Unlike the majority of the cupboard storage, drawer storage can be retro-fitted after your kitchen has been installed. It’s worth considering something other than wall tiles in a small kitchen but, if you do go for tiles, choose ‘brick-shaped’ ones to give the space the appearance of width. Glass splashbacks are a great alternative to tiles as they’re durable, available in any colour and, because of reflective qualities of glass, they help towards the illusion of space. Wall panelling is another substitute to tiles. It comes in many different colours and finishes and can be plain or fitted with rails to hang accessories on. 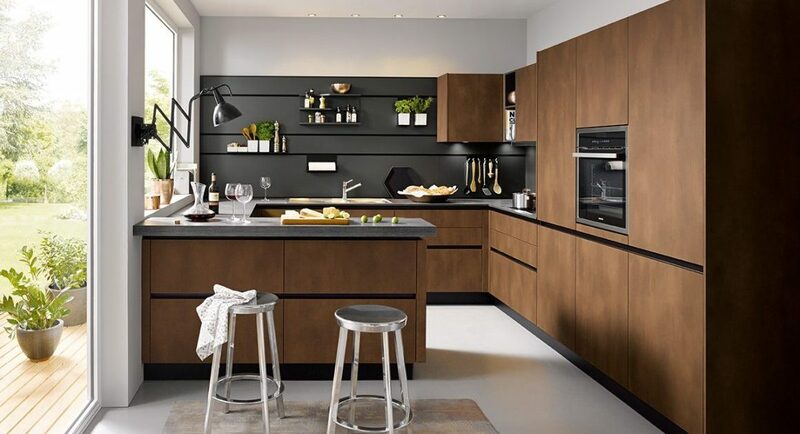 Both of these alternatives will give you a solid colour between the worktop and wall units (with no grout lines) which will enhance the illusion of space. The amount and type of light can make a huge difference to any space but this is particularly the case in small rooms. Aim to maximise natural light in your room by keeping blinds and curtains to a minimum and if possible, consider installing a roof light for even more natural light. When lighting the kitchen with artificial lights, be mindful of what the area is going to be used for; you’ll need bright, focused light over work surfaces but softer, ambient lighting to create an atmosphere for the dining area. To help with the illusion of space, installing plinth lighting will make the room appear wider than it is. 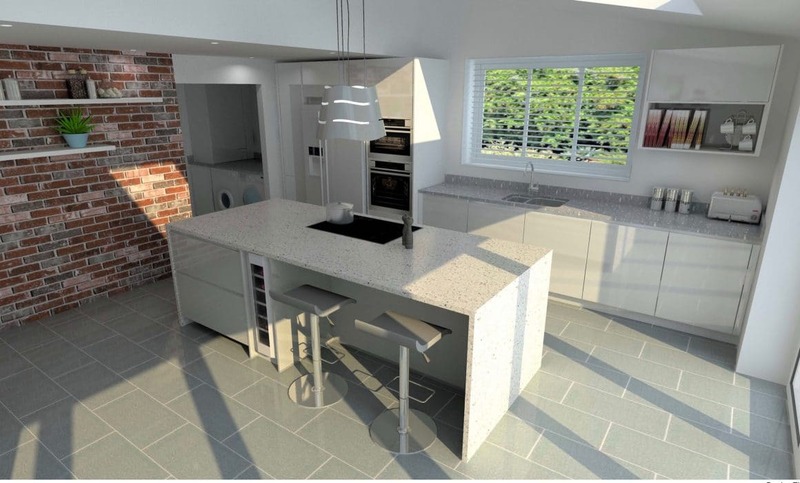 The kitchen style and colour that you choose can make all the difference as to how large or small your room appears. For small spaces, think light colours and fuss-free. Slab doors with a smooth finish, handle-less design in white or light grey colours work really well. The uninterrupted, fuss-free look is perfect for smaller spaces – it allows light to bounce off the surfaces and give the room a sleek and contemporary look. You don’t have to compromise on style just because your room’s a little on the small side. When decorating a small kitchen, use light colours and keep the majority of the space fuss-free but give it some interest by adding a statement piece that will become a talking point. It could be an exposed brick wall, an oversized eye-catching light fitting, a pop of colour in the units or some brightly coloured bar stools just aim to include something that will draw the eye and give the room a wow-factor. 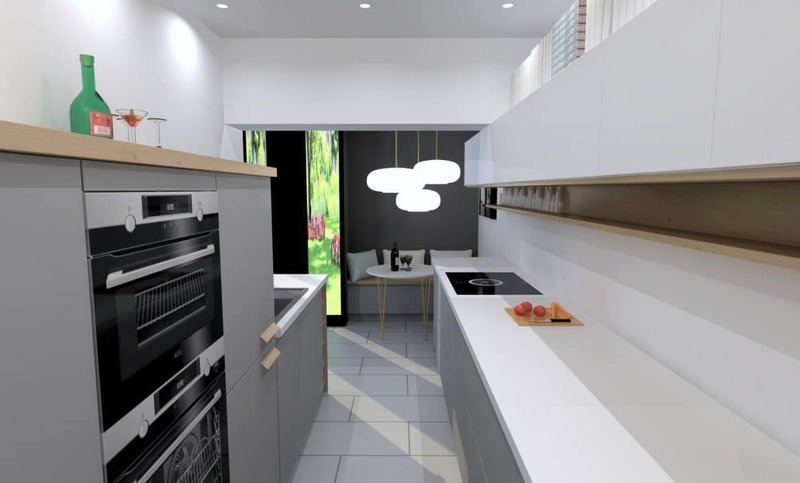 Whilst smaller rooms may be more challenging, there’s no reason why you shouldn’t have the beautiful, functional space that you deserve… and our kitchen designers love a challenge! If you’d like to spend some one-to-one time with one of our experienced designers, you can Book a Free Showroom Design Consultation online.